Using some of the world’s most sophisticated telescopes, a pair of astronomers has discovered a first-of-its-kind organic molecule in an enormous star-forming cloud thousands of light years away. And it could shed light on one of most poorly-understood properties of life on Earth. The molecule, propylene oxide (CH3CHOCH2), is chiral, meaning it can form “left-handed” and “right-handed” versions that are perfectly symmetric and have identical physical properties. Chiral molecules will be familiar to anybody who’s taken an intro biology course—they form the backbone of DNA and the building blocks of proteins. But oddly enough, the chiral molecules underpinning our biology are either left- or right-handed, never both. How this pattern of single-handedness, or “homochirality,” emerged on Earth is a mystery. Now, the first discovery of chiral molecules beyond our solar system could lead to answers. While the biological advantages of homochirality are obvious, what’s less clear is how this unique property of life emerged and why certain molecules exist in the left- or right-handed version. Given that the building blocks of life—simple chains of carbon, hydrogen, and oxygen—probably came from outer space, studying patterns of chirality beyond Earth offers a tool for peering into our distant past. Which is exactly what Carroll, and his co-author Brett McGuire, have spent the last the last few years doing. 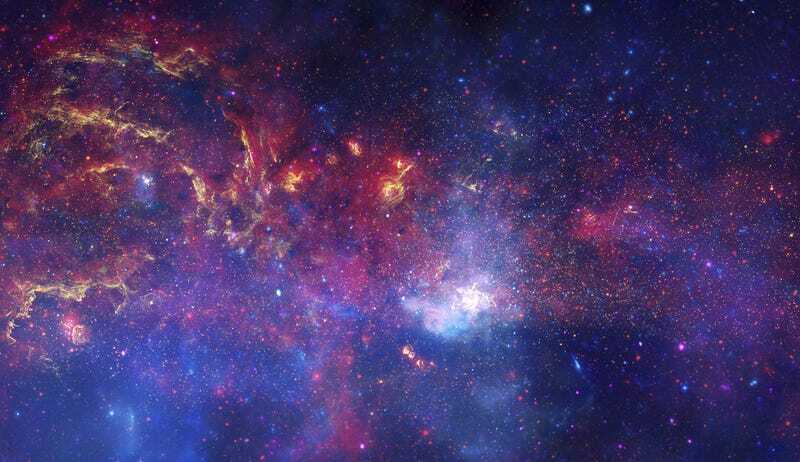 They’ve focused their research on Sagittarius B2, a cloud of interstellar dust that weighs as much as 250,000 suns and is situated some 28,000 light years away toward the center of our galaxy. SagB2 is something of a Holy Grail for astrobiology—the vast majority of the molecules ever discovered in space have been spotted in its swirling, radiation-bombarded dust. “It’s just the best place to find molecules,” McGuire told Gizmodo. Piggybacking on years worth of radio emissions data on SagB2 collected by the National Radio Astronomy Observatory, Carroll and McGuire recently began a search for propylene oxide, one of the smallest and simplest chiral molecules. After identifying some promising spectral features in the dataset, they independently confirmed the presence of propylene oxide using the Parks Radio Observatory in Australia. “If you add up all of the propylene oxide we found, it weighs about four fifths of an Earth,” Carroll said, adding that while this sounds like a lot, it pales in comparison to the size of the SagB2 cloud, and is just at the limit of our detection threshold. Larger, more complex chiral molecules are expected to be even rarer, and will prove more difficult to spot. But we may not have to find other chiral molecules in interstellar space to glean important insights into the origins of homochirality on Earth. “Even if we can’t detect other chiral molecules, if we can measure an excess of handedness in propylene oxide, that’ll be useful for understanding the processes driving chiral molecules in one direction or another,” Carroll said. It may be that because of how organic molecules form in interstellar clouds, any life that emerges anywhere in our galaxy is always going to be biased toward certain patterns of chirality. Perhaps left-handed proteins and right-handed genetic code are fundamental traits of life everywhere. Maybe the patterns that emerged on Earth are influenced by more local processes. Or maybe they’re just random. But it’s a worthy challenge, not just because of what it could reveal about our past, but because of its implications for humanity’s future. If and when we discover life on other worlds, will it be built according to a similar or different blueprint? Will it be “compatible” with our biology? And hey—any research that’ll help humans determine whether a planetary system is fit for colonization or a wasteland of indigestible lunch meats sounds like a solid investment in our future.